A group of UC students are so passionate about reducing plastic waste that they are taking on the Plastic Free July challenge! 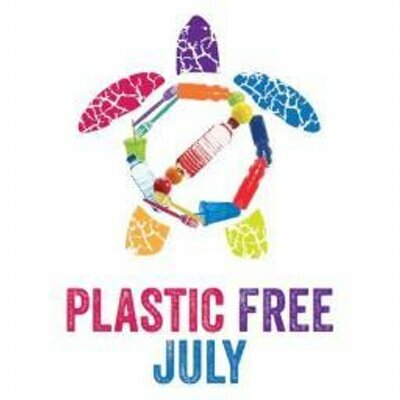 Plastic Free July is a worldwide charitable foundation that aims to raise awareness of the problems, dangers and amount of single-use disposable plastic in our lives, as well as challenges people to do something about it. Every year for the month of July, they challenge consumers to rethink their plastic consumption habits, and encourage us to use alternatives – think reusable coffee cups instead of single-use takeaway cups, and reusable bags over plastic ones. If you aren’t already trying to minimise single use plastics in your life, this Plastic Free July is a great place to start! You can do the challenge for a day, a week or the whole month. You can try to refuse all single-use plastic or try ‘just’ the top 4: plastic bags, water bottles, takeaway coffee cups and straws. So, what are we doing about raising awareness at UC? The Sustainability Office currently has nine wonderful Eco Volunteers who are going to be sharing some of their experiences and challenges during Plastic Free July! Poppy, Juliet and George are planning to explore Christchurch and let us know their favourite spots for zero waste grocery shopping and other essentials. They also promise there will be lots of coffee involved (in reusable cups of course), so prepare for some café chat too! Emily and Helena will also be blogging. Their focus is BYO (bring your own) reusable cups and containers. In what looks to be an eating and drinking crawl of Christchurch, Emily and Helena will be checking out where you can take your own containers for takeaway food and drinks, and where you can’t! Finally: Jess, Jessica, Varvara and Helena are holding a DIY Zero Waste Essentials Workshop on Tuesday 24 July, from 12pm – 2pm in Undercroft 101. They will be showing off their sewing and DIY skills, and teaching you how to make your own produce bags, beeswax wraps (plastic wrap is out!) and even face and body scrubs. And the best part – you get to take what you make home! Keep your eyes on our Facebook page for the month of July for all the event information, and tips and tricks from our volunteers on going plastic free for the month (or, longer). Are you keen to take on the Plastic Free July challenge too? You don’t have to go all out! You can choose to do it for a day, week or the whole month. Have a look on the website for ideas on how to get started (and no, you don’t need to sign up)! If you’re interested in being involved in sharing your experiences during Plastic Free July, please contact the UC Sustainability Office, they would love to hear from you!